Sorry I haven't got back to you sooner. I wanted to provide you a little background on the Remco Reproduction Biz and an update on current parts. First a little about myself and my brother Chuck who started the molding biz about two years ago. It started when I noticed a lot of Remco Robots on EBay missing the battery bar, claws, etc. I, like other grew up with Lost in Space and had the Remco Robot when I was a kid. One of my all-time favorite toys! Working with my Brother in law Larry a master modeler, he suggested I make the parts myself. Well being pretty good with building things all my life I gave it a try. Well making / molding parts took on whole new adventure for me! I first started to mold the claws. The molds started out pretty ruff, the material first used wasn't strong enough, the colors were difficult to obtain, etc. However, through a lot of trial and persistence I was able to produce some pretty good reproduction parts. The most difficult part to mold to date is the dome for the robot's head. It takes quite a few hours to mold and form the parts to all work together and hand fit to the robot's body. I know the Remco Robot inside and out, why they don't work, etc. Lately I've had customers send me there non-working robots to repair. This has opened a new area of opportunity for me. I've included a current price list (below) and a pic (attached) of the current parts available. Chest plate clear, or blue-green $25.99 ea. Battery bar red-orange, blue or black colors $19.99 ea. On/Off switch red-orange, blue or black colors $19.99 ea. 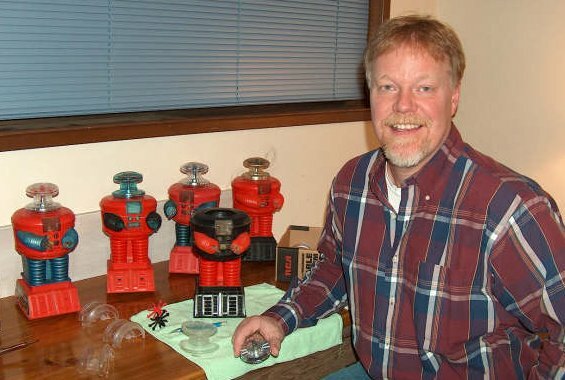 For those needing special work done on these Remco Robot's, Patrick & Chuck specialize in rebuilding and restoring these classic toys.